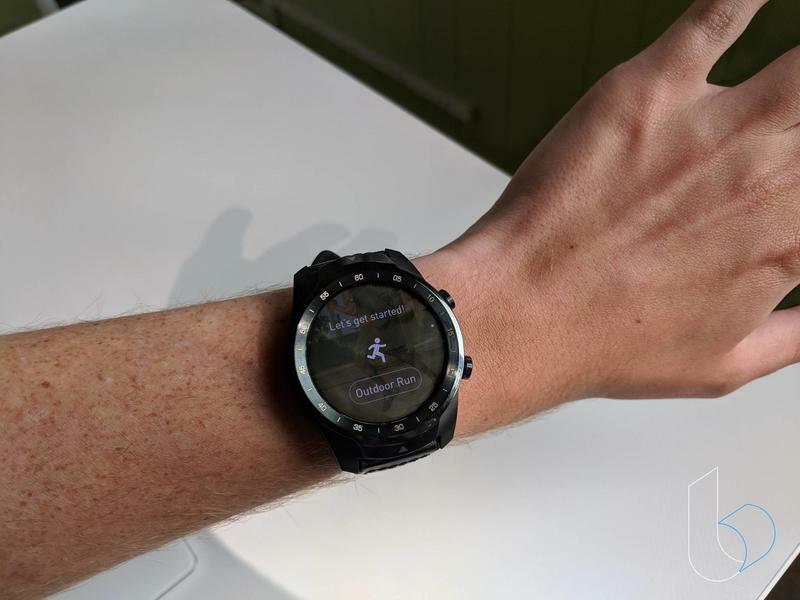 The TicWatch Pro is a Wear OS device. So you might be surprised to learn it features two displays. While most smartwatches use an LCD or AMOLED panel, the TicWatch Pro takes advantage of both. Its LCD screen activates when you're not using the smartwatch's AMOLED screen. Suddenly you have a blend of two eras on your wrist. 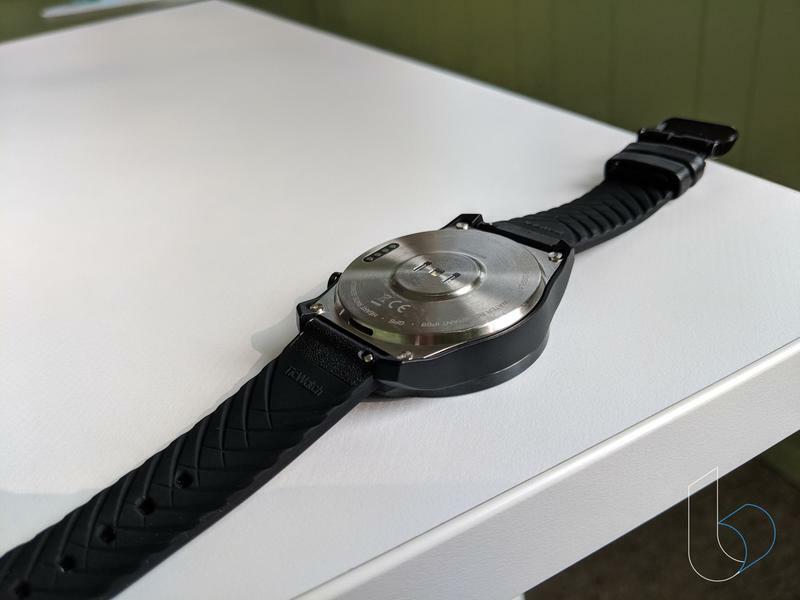 Mobvoi, which manufacturers this model, decided that users could get more out of their smartwatch by letting it double as a traditional timepiece to maximize battery life. 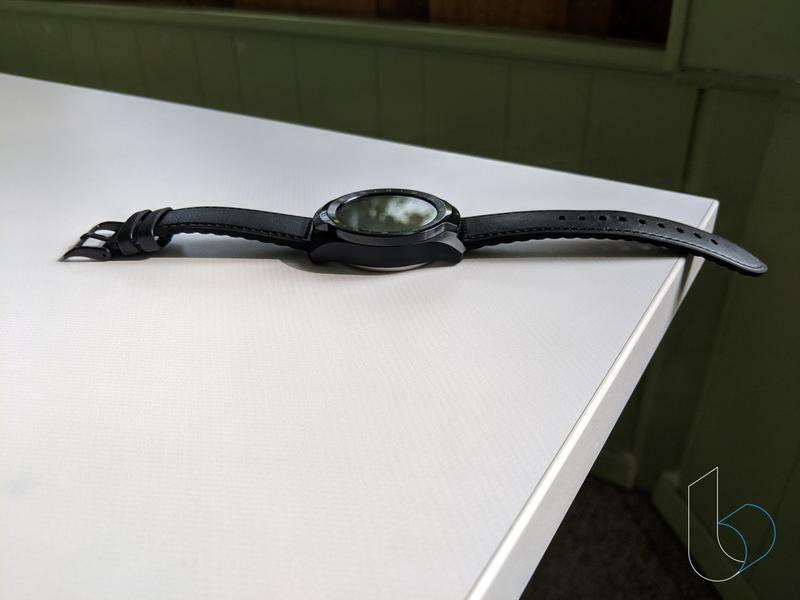 Depending on how the TicWatch Pro is used, you could get 5-30 days on a single charge. Is that realistic? We'll find out. From a design standpoint, the TicWatch Pro looks okay. It's more boring than stylish, honestly. 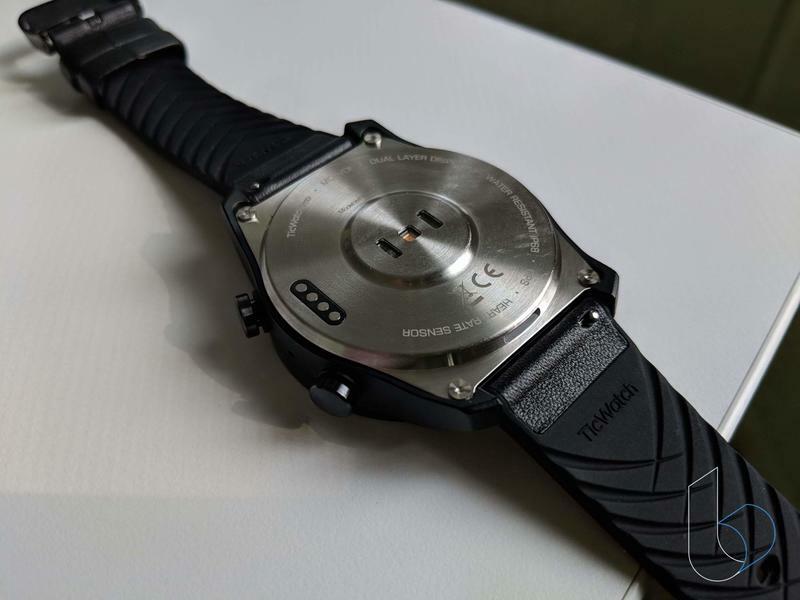 The TicWatch Pro comes in black or silver for the trim, but its carbon fiber-made case stays black. Mobvoi also tosses in a black leather strap. There's really no opportunity to liven up this smartwatch unless you swap for a third-party band. 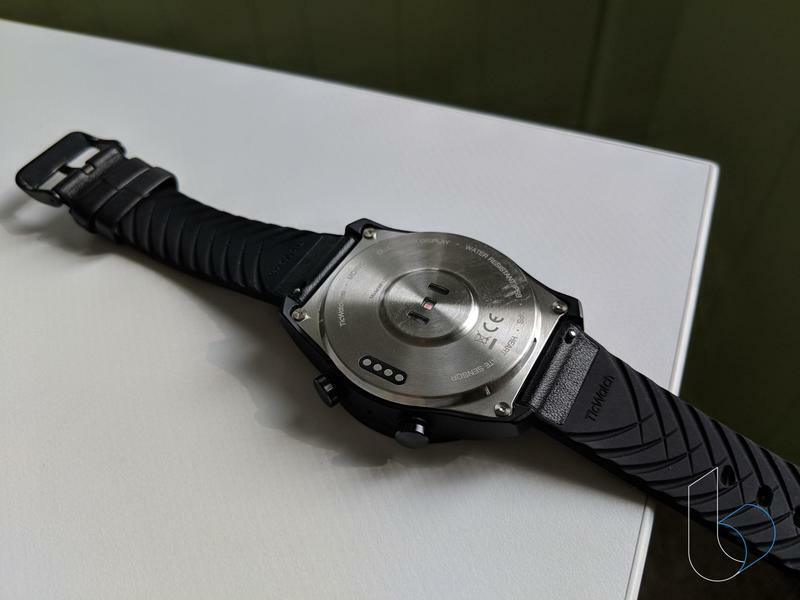 The unassuming design isn't big nor heavy, and its leather strap uses a silicone interior to avoid irritating your skin. 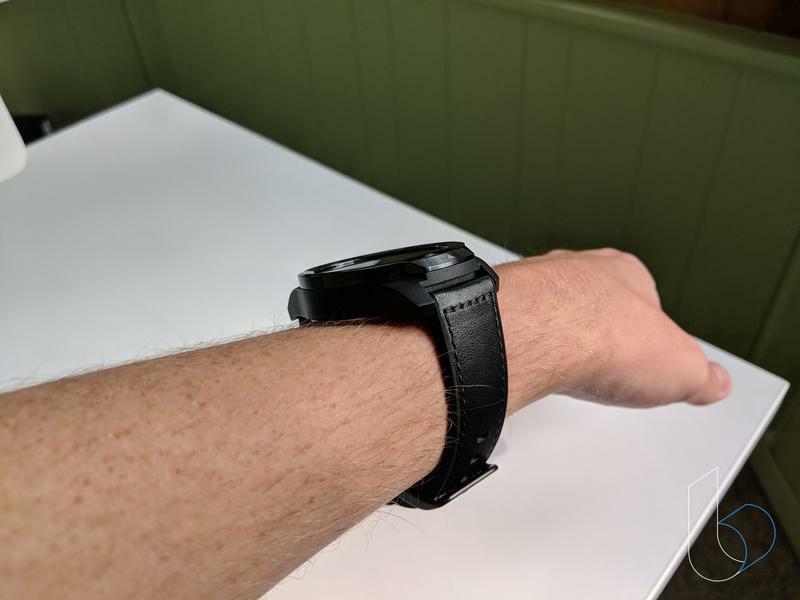 In this regard, the TicWatch Pro surprised me because I thought it'd look bulky on a small wrist like mine. Yet it sat as compact and comfortable as other premium smartwatches. 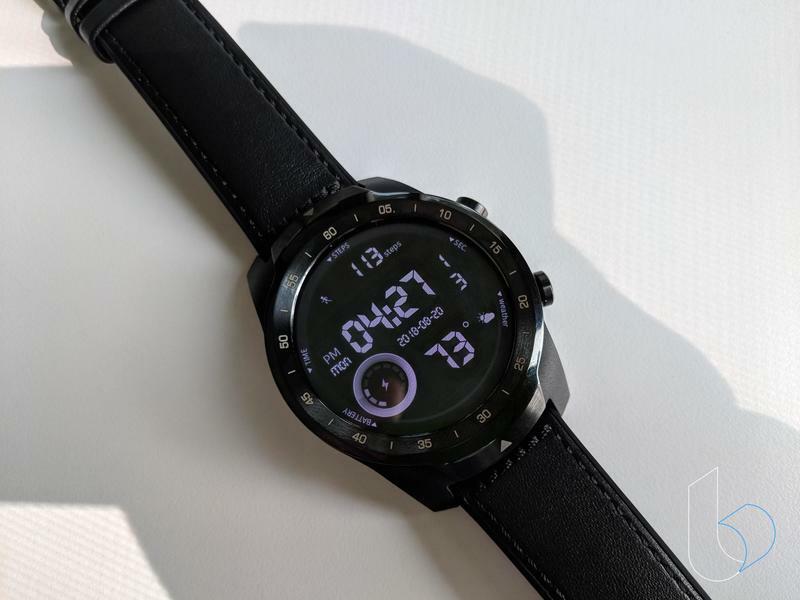 What I really, really dislike about the TicWatch Pro's exterior its bezel. Mobvoi put 5-minute markers around the 1.4-inch display. 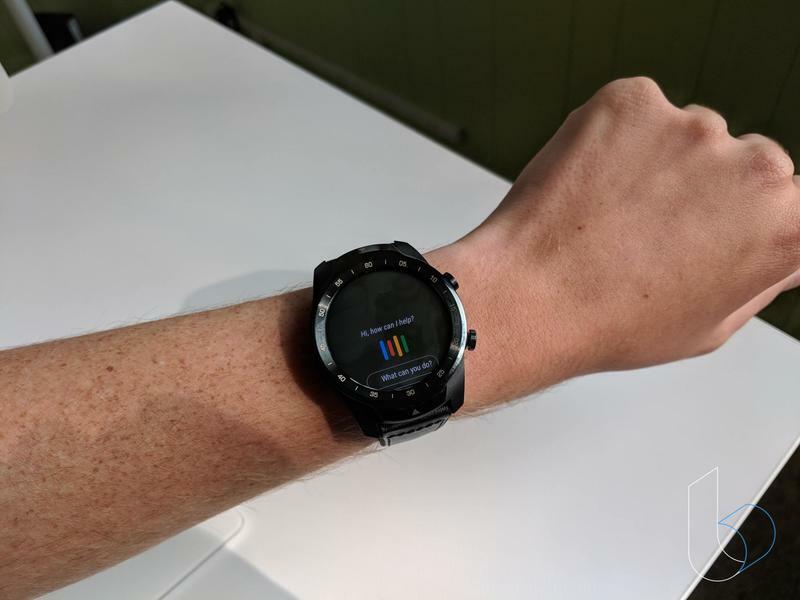 Aside from rendering the TicWatch Pro useless for right-handed use (because of where the buttons are), the markers seem so awkward on a device with a color display. As for those buttons, you get two of them. They're present to manage power, activate Google Assistant, open a user-designated default app, launch Google Pay, and jump into shortcuts. These are definitely useful, especially if you typically have a bunch of different apps on your smartwatch. The TicWatch Pro reminds me of the watch my dad puts on for the weekend. It's plain on the outside, and if it tells the time/date he's good to go. That may work for a man in his 50s, but most of us want our smartwatches to be stylish and refreshing. On the TicWatch Pro, you have Smart Mode and Essential Mode. The two are very different as they direct how the display will behave. If you choose Smart Mode, you'll get around two days of use on a single charge. The AMOLED screen will work as usual and the LCD panel fills in the gaps. But the estimate (and actual results) dip when you activate Wear OS' always-on feature. Essential Mode tells you the time, date, and steps taken at a glance. Your smartwatch's display won't have any color, but the LCD screen ensures you get the basic information to go about the day. It can maximize battery life to multiple weeks if you really avoid any serious interaction. The idea seems neat, but the whole reason to get smartwatch doesn't exist in Essential Mode on Mobvoi's TicWatch Pro. A smartwatch isn't nearly as intriguing when you strip it of a color, UI-driven display. You want apps, notifications, and real-time data on a wearable. Maybe you'll find value in Essential Mode when you're running out of battery life but still want a functioning watch. 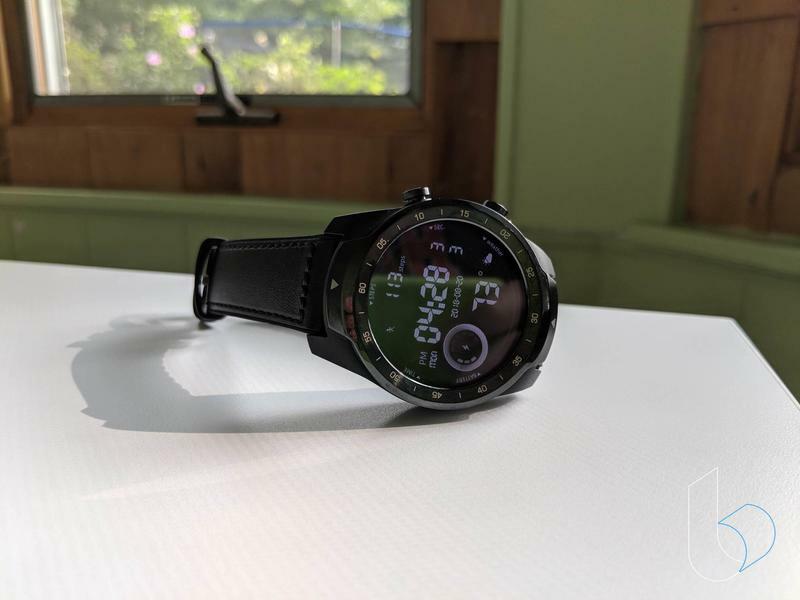 The most disappointing area for the TicWatch Pro is its performance. Inside, there's a Snapdragon Wear 2100. Qualcomm announced this chip more than two years ago, but Mobvoi chose it anyway. No doubt that was a cost-related move. Well, that's not beneficial for users. 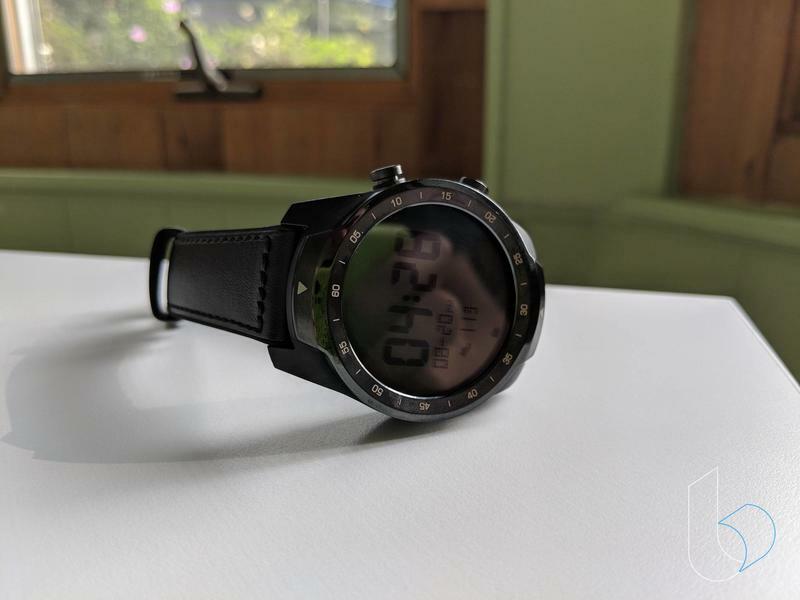 The TicWatch Pro slowly wakes up, struggling through notifications and apps. 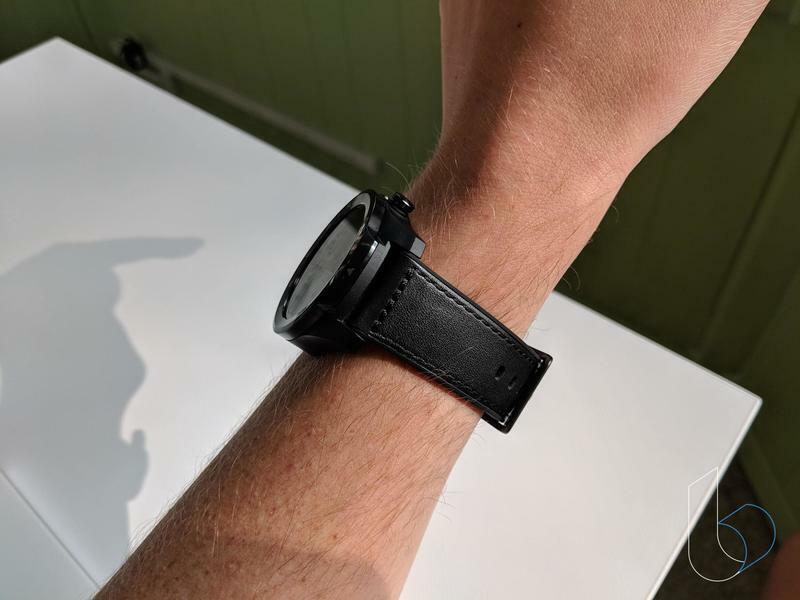 Wear OS, though, could be harming responsiveness as well. Google's platform is broken, not in terms of bugs but reliability instead. Basically, no Wear OS device runs fast and smooth. 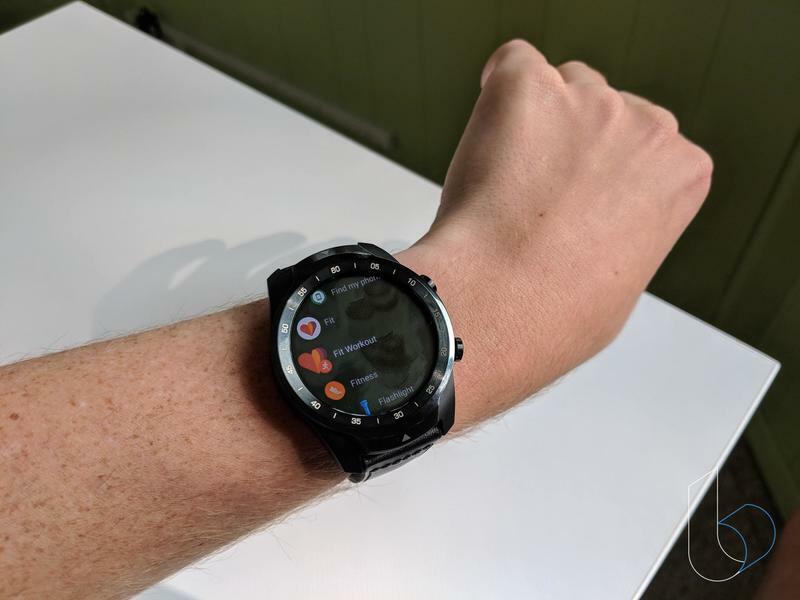 This fall, let's hope Wear OS undergoes a major overhaul. Admittedly, it's fantastic to see the TicWatch Pro ship with a microphone, speaker, and NFC. Just hope that Google Assistant and Google Pay can act fast enough if you fire them up on a whim. In recent months, we've seen Mobvoi build out a portfolio of budget-friendly smartwatches. The TicWatch S and TicWatch E arrived earlier in the year. Both are still on the market (and very affordable, too). The TicWatch Pro doesn't disregard the playbook. However, even though it's somewhat inexpensive, there were some cuts that make the experience suffer. The TicWatch Pro shouldn't be stuck with an outdated chip. Performance aside, the battery life when using the AMOLED screen normally isn't too comforting. And we're not sold on the design. For a smartwatch that should battle the Gear Frontier, Mobvoi's TicWatch Pro seems lame. As much as the TicWatch Pro might fit into your life, you should wait before pulling the trigger on a new smartwatch. It's entering the market at an awful time. The Galaxy Watch is here, and we're only weeks away from seeing the Apple Watch Series 4. 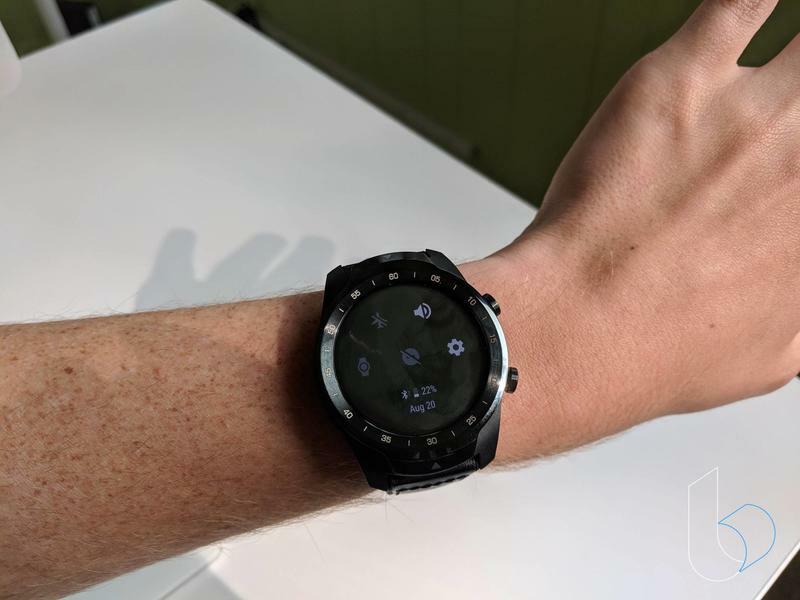 Google, meanwhile, will reboot Wear OS in the fall with a smartwatch of its own. Anyone who purchases the TicWatch Pro today will be disappointed by the swanker alternatives on the horizon. Mobvoi couldn't beat the clock. Now that's a haunting error. 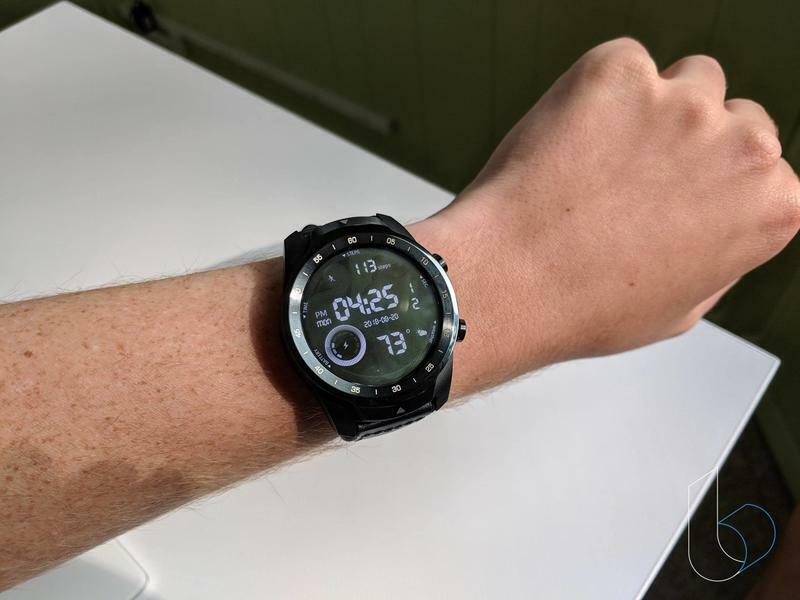 If the TicWatch Pro was released several months ago, it would've been a no-brainer to recommend. During the second half of 2018, we suggest waiting to see what the big brands put forward. Your wrist will thank us. 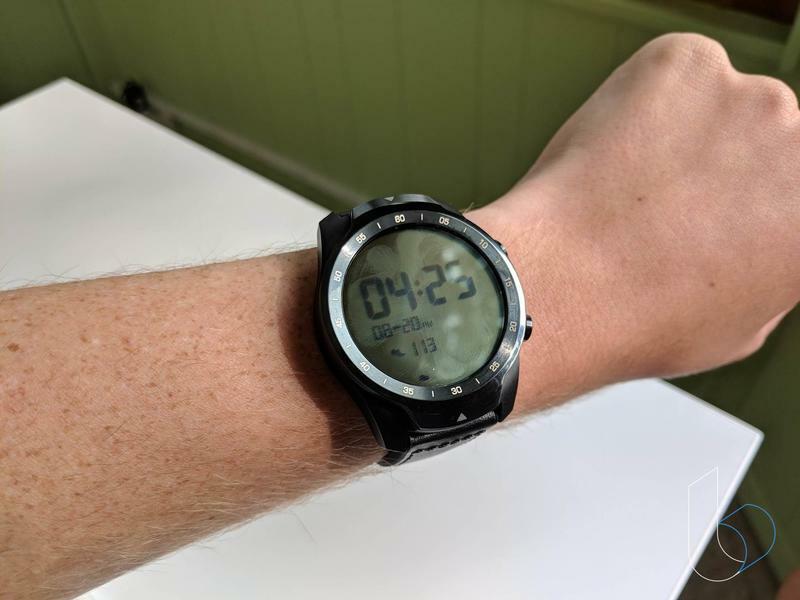 Editor's Note: The TicWatch Pro was provided by Mobvoi, and TechnoBuffalo used it for approximately 2 weeks before returning the unit.